When designing heat sinks, it’s important to accurately measure their cooling capacity. 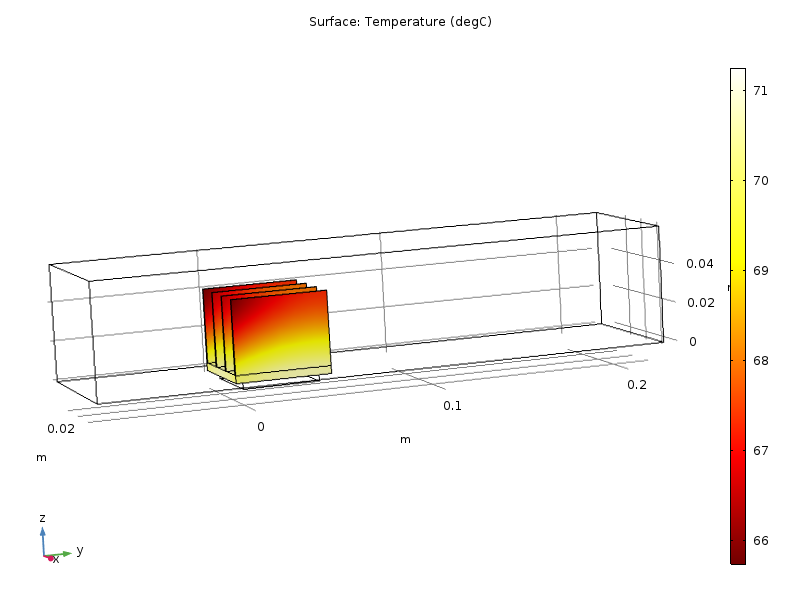 By modeling heat transfer in these systems, we can calculate the temperature of the electronic components. The modeling approach we use will affect the accuracy of the results and the efficiency of the simulation. In this blog post, we compare two modeling approaches for analyzing electronic chip cooling. We also discuss new features in the COMSOL Multiphysics® software that make it easier to set up heat sink geometries. 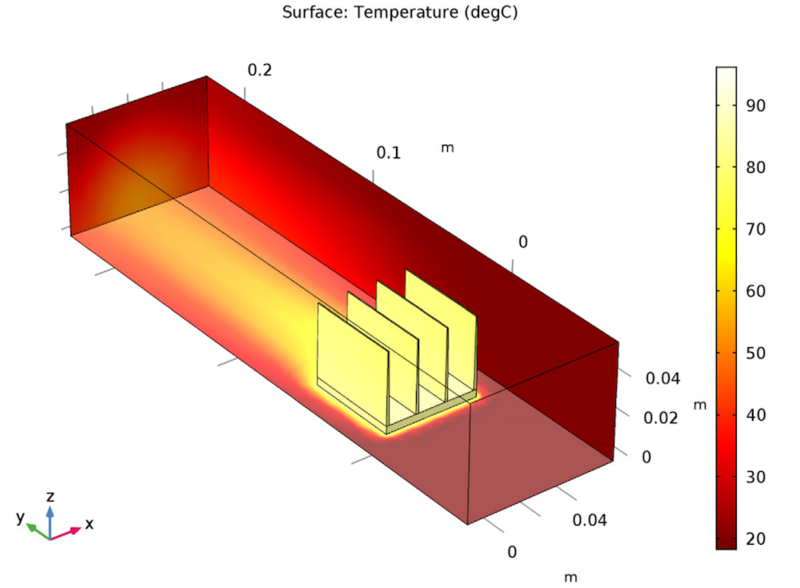 A frequent topic on the COMSOL Blog, heat sinks dissipate excess heat in electronic devices. 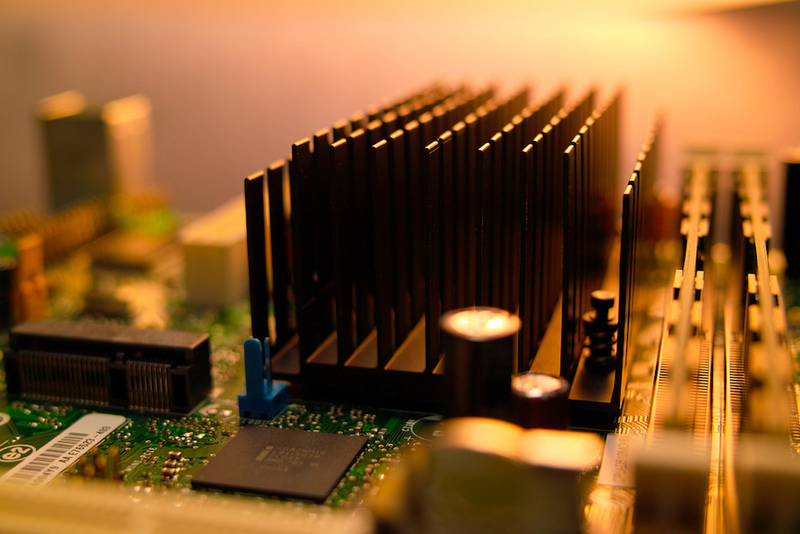 Heat sinks have become more important with advancing technology. As electronic devices become more powerful, they often generate more heat. This can impair the performance of these devices and even reduce their lifespans. A heat sink on a motherboard. Image by Adikos — Own work. Licensed under CC BY 2.0, via Flickr Creative Commons. 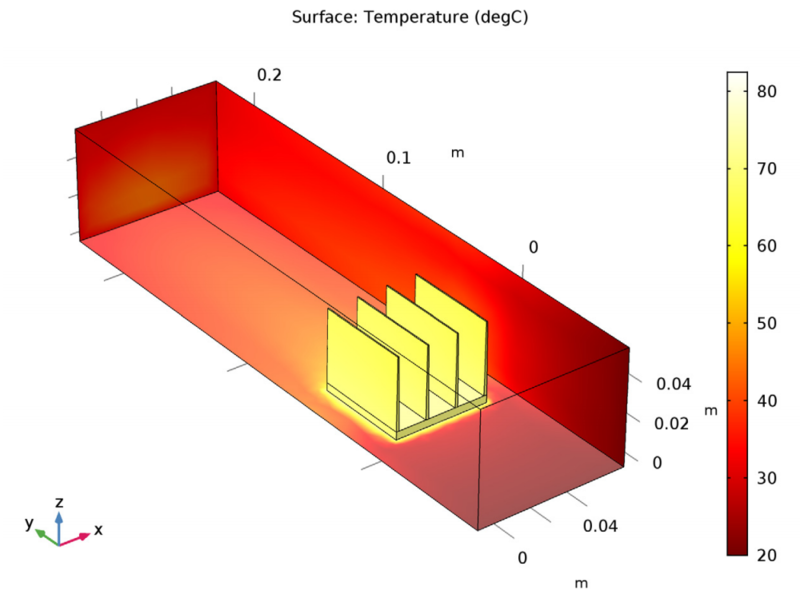 To analyze the cooling capacity of a heat sink, we can turn to the heat transfer modeling capabilities of COMSOL Multiphysics. Due to the flexibility of the software, we can approach the analysis in multiple ways. Let’s discuss two of these approaches using the simple example of electronic chip cooling. For our example, we model an electronic chip with a heat sink that is cooled by the surrounding fluid (air). To create the model, we use the heat sink geometry parts available in the Part Library in the Heat Transfer Module, an add-on product to COMSOL Multiphysics. These parts, which are available as of version 5.3, make it easier to include a heat sink in a model geometry. For more details, check out the Heat Transfer Module Release Highlights page. In this case, the model consists of an electronic chip and aluminum heat sink. The heat sink is mounted within a channel that has a rectangular cross section. As for the electronic component, it dissipates the equivalent of 5 W of heat. This is distributed throughout the chip volume. 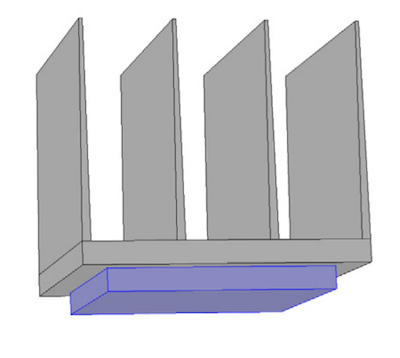 Model geometry of the heat sink (gray) and electronic chip (purple). Air flows from the inlet (where the temperature is set) through the channel to the outlet. There, convection is the main form of thermal energy transport. A combination of conduction and convection transports the thermal energy in the cooling air, while conduction transfers thermal energy in the electronic component and heat sink. The model enables us to solve for the thermal balance between the various components and to find the thermal contact between the chip and the heat sink when dealing with a thermally thick layer. We can estimate the cooling capacity of the heat sink and predict the temperature of the electronic component by solving the model equations. Next, let’s look at the two different approaches for solving this model, starting with the more computationally efficient approach. For the first approach, we only model solid parts and use a convective cooling boundary condition on the heat sink boundaries instead of computing the flow velocity, pressure, and temperature of the air channel. This enables us to make rapid computations. However, the accuracy of these computations is tied to the reliability of the heat transfer coefficient used to define the convective cooling boundary condition. Here, we use an empirical value of 10 W/(m2·K). Temperature plots for the ideal contact (left), air layer (middle), and thermal grease layer (right) configurations. As expected, the lowest maximum temperature (around 84°C) is obtained for the ideal contact case. When we include an air layer between the heat sink and chip in the model, this rises to almost 95°C, causing the performance of the cooling system to decrease. We can reduce the effect of this thermal resistance by swapping out the layer of air for a layer of thermal grease. The thermal grease layer improves the thermal contact between the base of the heat sink and the top of the electronic chip. The simulation predicts that the maximum temperature nears that of the ideal thermal contact case. From this, we can conclude that a thin layer of thermal grease helps to improve the heat sink design. Moving on, let’s take a more computationally expensive approach that adds a domain representing an air channel to the model. This domain allows us to calculate the temperature and flow fields of the air while assuming nonisothermal flow in the channel. This approach is more general than the previous approach, which is helpful, since the heat transfer coefficient is generally unknown. This way, we can accurately simulate flow cooling without needing to approximate the heat transfer coefficient. The results from this approach show that the maximum temperature of the electronic component is around 95°C. In addition, there is a hot wake behind the heat sink, indicating its convective cooling effects. This second modeling approach is also more precise. For example, we can visualize and predict the temperature difference on a fin at the edge facing the flow or at the opposite side. The temperature field on the heat sink’s surface and channel walls (left). Visualizing the temperature difference on a fin (right). We can enhance this approach by modifying the model to account for a large (close to 1) surface emissivity. Since surface-to-surface radiation should be considered when working with such large emissivities, we include it in our simulation. This addition lowers the maximum temperature to around 81°C, as seen below. This reaffirms that when the surface emissivity is large, radiative heat transfer should be considered. The temperature field when surface-to-surface radiation is included. As we’ve seen here, COMSOL Multiphysics offers tools that make it possible to use different approaches to analyze electronic cooling — an important step in the design of heat sinks for optimized electronic devices. 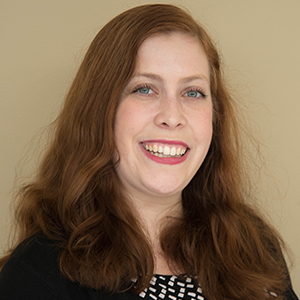 Each modeling approach has its own benefits, whether it be a more computationally effective option or a method with higher accuracy.